Welcome to the inaugural edition of the Robbins College of Health and Human Sciences e-newsletter. 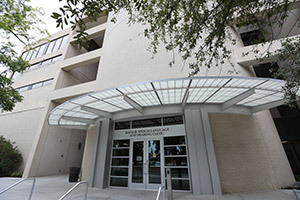 The Robbins College was launched on June 1st, 2014 after more than three years of evaluation and input from Baylor regents, deans, faculty and staff, external entities including healthcare partners. The departments of Communication Sciences and Disorders, Family and Consumer Sciences along with Health, Human Performance and Recreation participated with others in a strategic vision to form the college. Your departments have long and storied histories of serving and preparing scholars and leaders for serving professions in the health sciences enabling us to say we are bound by both innovation and tradition. The formation of the Robbins College provided a visible presence around the notion of building on Baylor’s tradition of healthcare and improving quality of life through research, teaching and community engagement. Building on Baylor’s distinct integration of faith and academic excellence, we will provide students with an expansive understanding of holistic approaches to improving health, human well-being, creativity, critical thinking and quality of life outcomes among individuals and families. As one of the core convictions from Baylor’s vision, Pro Futuris indicates, Baylor University exists to "promote the health of mind, body, and spirit as these are understood in the Christian tradition". Baylor's core convictions also call us to "strive to illuminate and enrich human experience by the word of God and the best of human science and culture. The vision of the Robbins College will build on these core convictions to prepare scholars and leaders who can translate research findings and practice in order to advance knowledge and improve health, human behavior and quality of life. In this e-newsletter and more to follow we will update you on the great accomplishments of our students, faculty and your fellow alumni who are making a difference locally and globally by being servant leaders in their professions, through community engagement, research and creative works. Sic 'Em Bears! The Department of Communication Sciences and Disorders has a beautiful new facility. CSD now has 22 treatment rooms, 4 group treatment rooms, a magnificent audiology suite, and 6 fabulous labs for research faculty. The department plans to expand the graduate program from 49 graduate students to approximately 100 in the next four years, which will double the number of individuals CSD can serve with communication disorders. We now have a partnership with the Baylor School of Music and have been able to expand our Voice clinic to new heights. We offer an interdisciplinary clinical experience for both our clients and graduate students where we collaborate with a Clinical Psychology Intern, with an ENT, and with a reading specialist. We have expanded our work in the area of Augmentative Communication and "Pediatric Feeding Issues". In addition to our onsite clinical programs, we provide trainings and screening opportunities to a variety of community settings, such as, Piper Child Development Center, Care Net, several public schools as well as various industries in the Waco area. CSD has ongoing research in the areas of language, literacy, phonology, and fluency with new avenues of research opening up. We recently completed an investigation using an EEG protocol in combination with behavioral testing in order to examine the relationships between resting-state EEG metrics and language function in children with language and reading disorders. Exciting new research potentials include collaboration with the School of Music and the School of Engineering. It is an exciting time to be in the Department of Communication Sciences and Disorders! Dr. Park participated in the 2016 Annual International Convention hosted by the Korean Academy of Speech and Language from Sep 9-10. Dr. Park also presented a 90-minute lecture on "Neuroanatomy and Psycholinguistic Model of Dyslexia" to a group of 24 researchers and doctoral and master’s students of speech-language pathology at Ewha Woman’s University in Seoul, Korea. Dr. Park is currently preparing an NIH grant proposal on the design and construction of a multilingual child language database in collaboration with a group of international researchers. This database will provide a clinical database that represents multiple ethnolinguistic groups of English-learning bilingual children. A great deal of information, due to the collection of a large amount of linguistic data, is expected to help speech-language pathologists who serve culturally and linguistically diverse children to identify major risk factors for language impairment, providing a great training opportunity to build a feasible, effective and error-free diagnostic-therapeutic path. Dr. Ritter’s research focuses on the study of language and literacy in the school-age child. Her research investigates typical as well as atypical development in school-age children in order to develop new treatments to improve intervention outcomes and academic success of children with language and reading disorders. Dr Ritter recently completed an investigation in collaboration with Dr. Fillmore using an EEG protocol in combination with behavioral testing in order to examine the relationships between resting-state EEG metrics and behavioral language testing results in children with language and reading disorders. Dr. Blanchet’s research examines listeners’ perceptions of people with communicative disorders, particularly stuttering and/or cluttering. He initiated this line of research in 2005, and it has since "blossomed" into a multi-study, transdisciplinary endeavor involving both students and faculty from various disciplines (e.g., psychology, sociology). This semester, Dr. Blanchet conducted a study examining the effects of self-disclosure (or acknowledgment) of stuttering on students’ perceptions of a person who stutters. A URC grant enabled him to hire six undergraduate students to assist him with data collection. Findings of this study will add further support for clinical use of self-disclosure. Although this strategy has been utilized to great effect by many stutterers for decades, there is a need for further research demonstrating the benefits of disclosure, empirically. Dr. Fillmore’s primary areas of specialization are in neurogenic communication disorders and brain-based research methods. 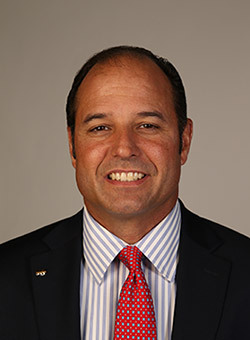 His research interests include the neural correlates of speech and language processing (particularly the interactions between bottom-up and top-down processing in speech comprehension), and applications of cognitive training and neuromodulation techniques to improvement of speech and language function. He is currently working on validating an assessment of sensory contributions to speech comprehension and examining the relationships between resting-state EEG metrics and language function in children with reading disorders. 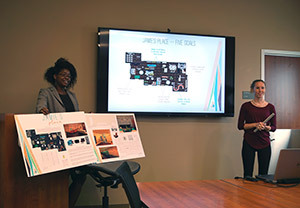 Teams of Senior Baylor Interior Design students provided Jamie’s Place, a grief counseling center in Waco with a design solution for a new space proposed in the MacArthur Hillcrest Building. Jamie’s Place is a grief program created to support children who have experienced the death of a family member or friend. The program offers healing through support groups, education and community outreach. Currently they do not have a permanent location but meet in the Baylor Scott and White McClinton Cancer Center. The director, Michelle King had written a grant proposal that would allow them to finish out a space at the MacArthur location. The students took measurements at the proposed site, interviewed Michelle King to find out what types of spaces Jamie’s Place would need, and researched grief support groups. The teams provided Jamie’s place with digital design boards that included the space plan, perspective drawings and furniture and finish selections. They also provided them with a booklet with the concept, drawings and specifications for the furniture and finishes. The Health, Human Performance, and Recreation (HHPR) Department at Baylor University is uniquely positioned to partner with the medical community in order to help Texans improve their health and reduce chronic disease risk and - at the same time - strengthen our instruction and research efforts. 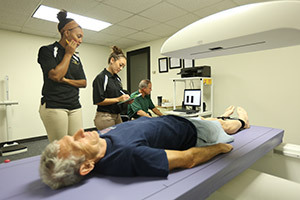 Program offerings in HHPR’s Baylor Laboratories for Exercise Science and Technology (BLEST) have been designed to engage our students in advanced academic experiences through service learning and research. These academic experiences compel students to integrate and apply their Christian worldview and develop knowledge, skills, and competencies in the clinical exercise and health sciences and related medical professions. Our medical partners directly benefit by extending their community footprint in primary chronic disease prevention programming; offering unique training and exposure for medical residency programs, and; establishing a stronger platform for collaborative research and funding opportunities. Our faculty/student/physician partnerships benefit fellow Texans by providing those who traditionally do not have health care access to individualized health information, therapeutic lifestyle programming, and resources to address chronic disease risk reduction. For example, our students and faculty work alongside resident physicians in a program we call "FitCheck". We provide health and fitness assessments that inform participants about their health and fitness needs. An assessment can help individuals develop a plan to address his/her fitness interests or to address particular health issues. An added benefit is to track health and fitness progress over time. Our FitCheck health and fitness profile is a perfect way for anyone to get an evidence-based exercise prescription that is tailored specifically to meet his/her health and fitness needs. Our current research is aimed at examining the effectiveness of a single dose of exercise to improve vascular function. We are testing how the exercise dose, delivered in a continuous fashion at moderate intensity or in high-intensity intervals, may influence vascular response. In addition, we know that exercise does not exist alone as a lifestyle habit. So, we have studies underway examining how poor diet and inadequate sleep influence the effectiveness of exercise to maintain good vascular health. Along with our physician partners, we are also tracking physical health and fitness among new physicians as they progress through their three-year residency program.